It is a sunny day. But the thermometer reads minus 7 Celsius outside. I have put extra food out on the terrace for the birds. And we have brought Artur into the house for a few days. And boy does he think all his Christmases have come at once. He is sitting here beside me on my desk. On a cashmere blanket. Trying to catch my fingers as they move across the keyboard. He is purring so loudly I can barely hear my podcast of This American Life over his happiness. So with such contentment in the room I thought I might give you another of my Garden Tours. The lavender bank. 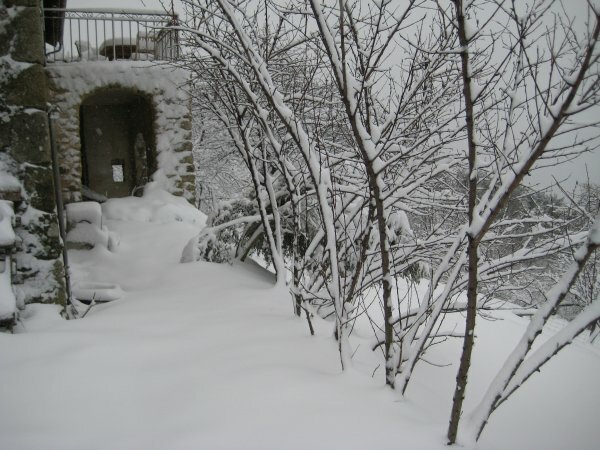 It sits immediately in front of the main house on a small but steep slope. 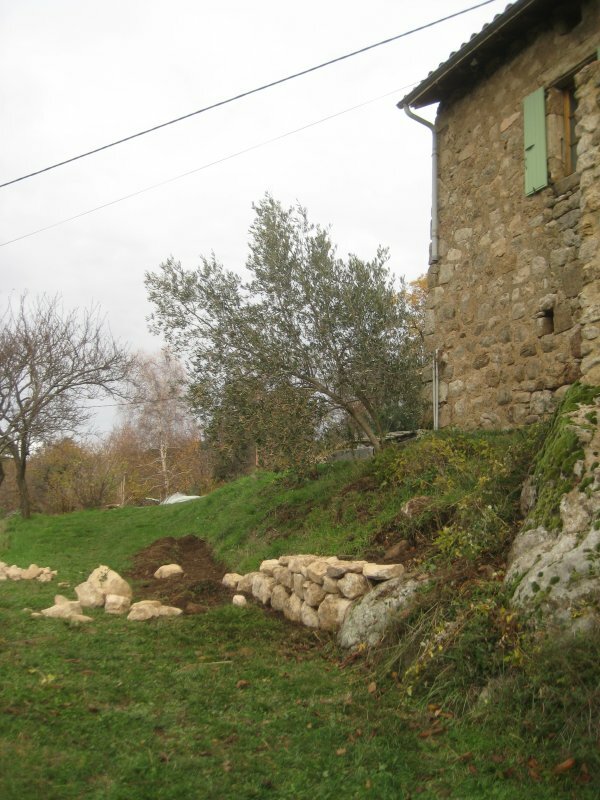 This whole area came about for two reasons; we had an excess of granite stones from a building project back in 2010. And I read a biography of Nicole de Vesian. 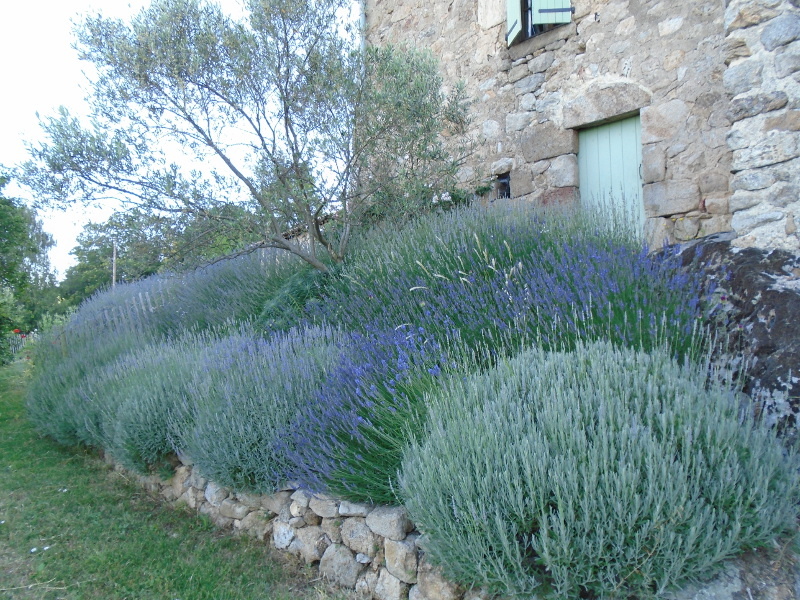 She was a garden designer who created some magnificent gardens further south in the Luberon. 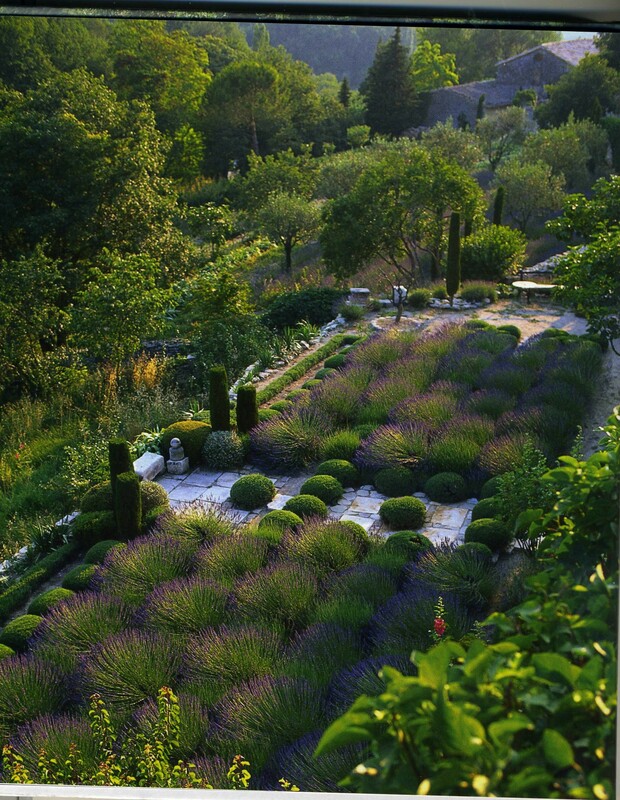 Most garden obsessives know her garden La Louve in the village of Bonnieux. 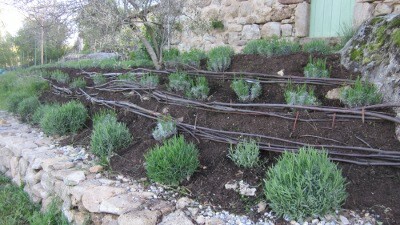 It is not a large garden, and constrained by the fact it is built on terraces and in a village setting. But it has the most extraordinary sense of place. Forget prairie planting, herbaceous borders, this is a garden that has the most restricted plant palette. 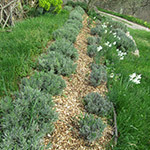 It is predominantly a topiary garden planted densely with Mediterranean plants – sage, cistus, box, rosemary and lavenders. The hard landscaping is pebbles, rocks and not much else. It was her affinity with terrace gardening that stuck a note with me. 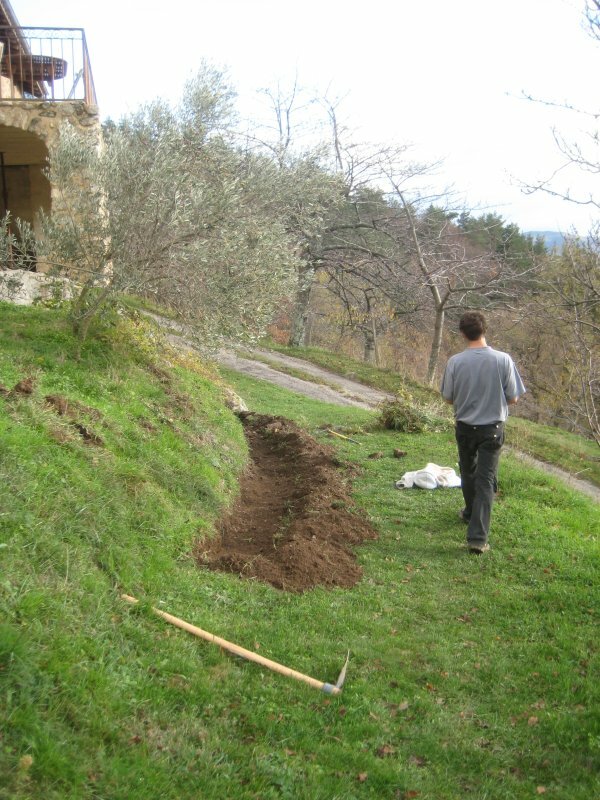 So much of the time on these mountain gardens you are looking up and down the landscape. 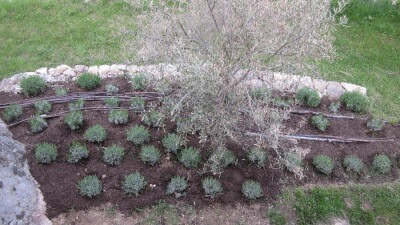 It’s a curious view of plants and you have to start thinking of how these gardens are going to be seen. Or as some pretentious garden magazine article declared about a London garden – it has to read well from the first floor of the house. And ‘reading well from the first floor’ was the exact thought that comes into my head when I open my wooden bedroom shutters and look down on this part of the farm. And it wasn’t a pretty sight. 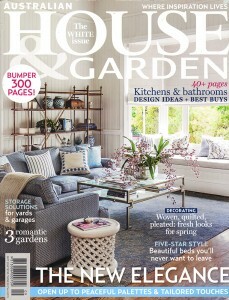 But before we slip into garden design speak, let’s start from the beginning. 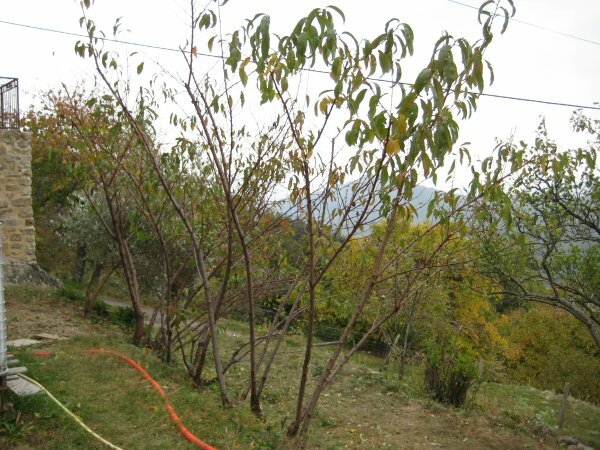 In 2007 this bank was planted up with four peach trees. White clingstone peaches that had the most tremendous infection of peach leaf curl you will ever see. I gave them a year. That first year I was too scared to cut down anything. Apart from bramble forests and pine trees in the wrong place. But the peach leaf curl was a serious problem. And compounded with the fact the fruit was a big mealy clingy dry disappointment. There was one tree on the slope that survived my murderous thoughts. A mad large olive tree. We are way too high in altitude for olives. But our previous owner wanted to prove people wrong. 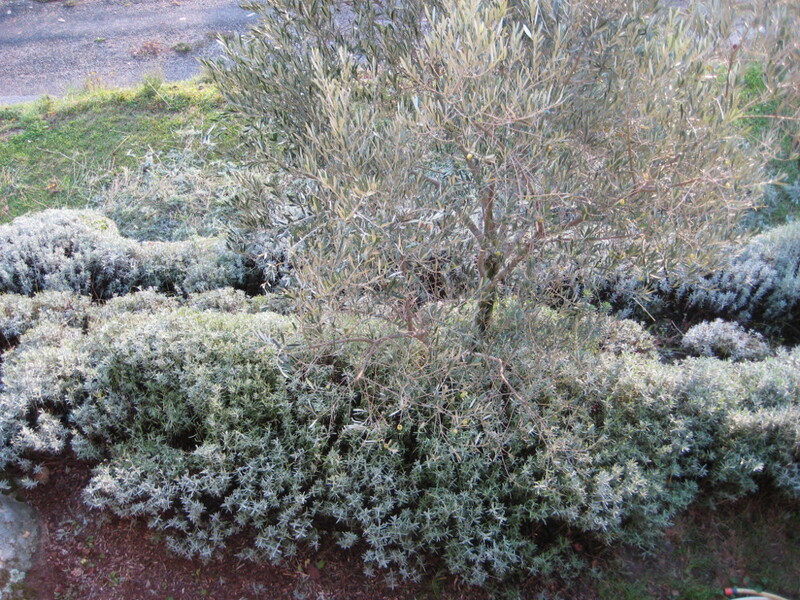 So he coddled these two olives (there is another down on a lower terrace) with straw wrapped around the trunks each winter and confined in sacking. He nurtured, he cajoled. And these two olives are thriving. It’s a shame he didn’t give a thought to any prunin g. The one on this bank leans unattractively. But it gave me an idea. 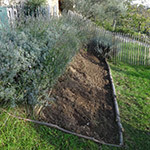 Why not plant more olives around it and call it the olive bank? I am nothing if not poetic when it comes to naming parts of this garden. 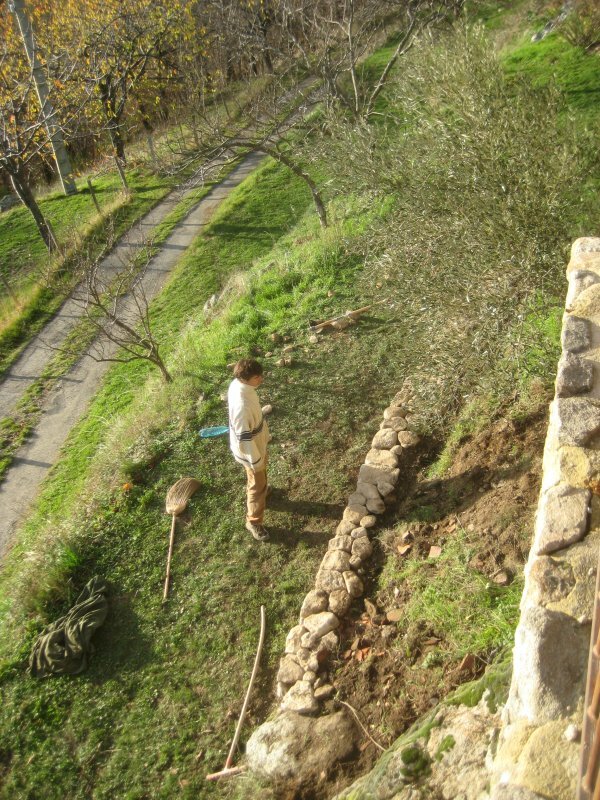 Meanwhile Nicolas built me a lovely little retaining wall. I do love hard landscaping to define a space. The olives? They had one year. Two winters. 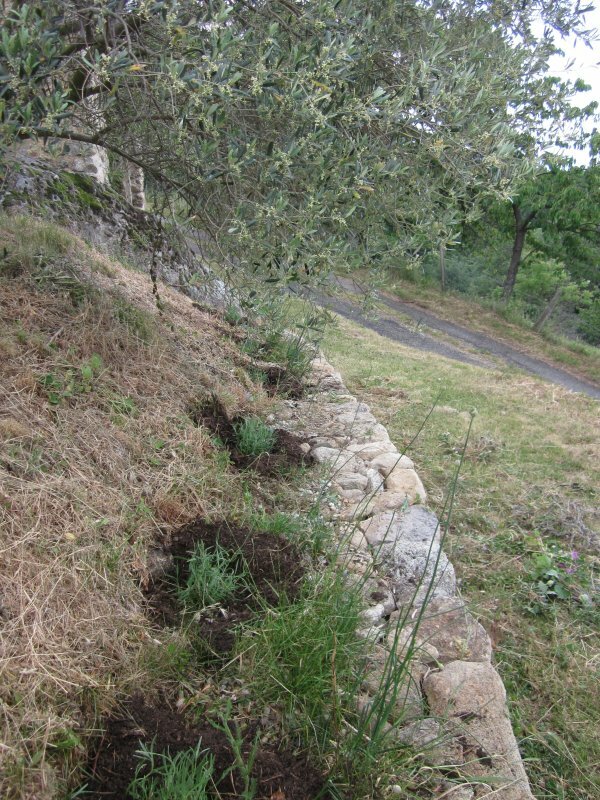 That is all it took for me to realise that small olive trees are never going to have any fun here. And I certainly wasn’t the coddling and nurturing type when it comes to trees. They cope or they don’t. So out they came and in went the most logical plant I could think of. 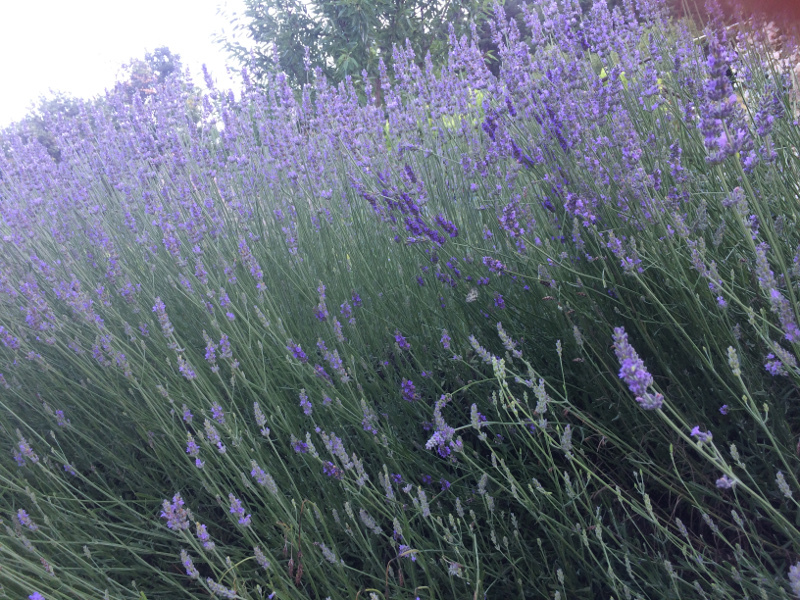 Lavenders. 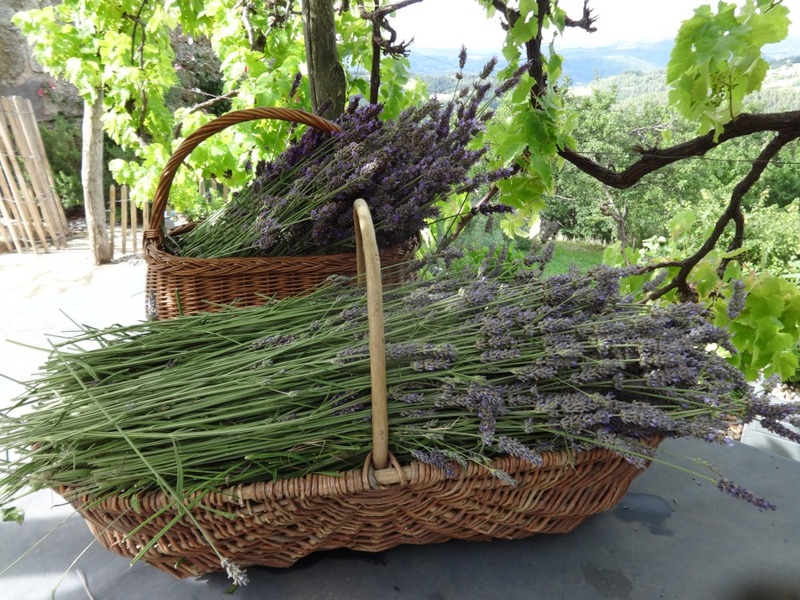 Remember Nicole de Vesian’s lavenders? These are the same plants. 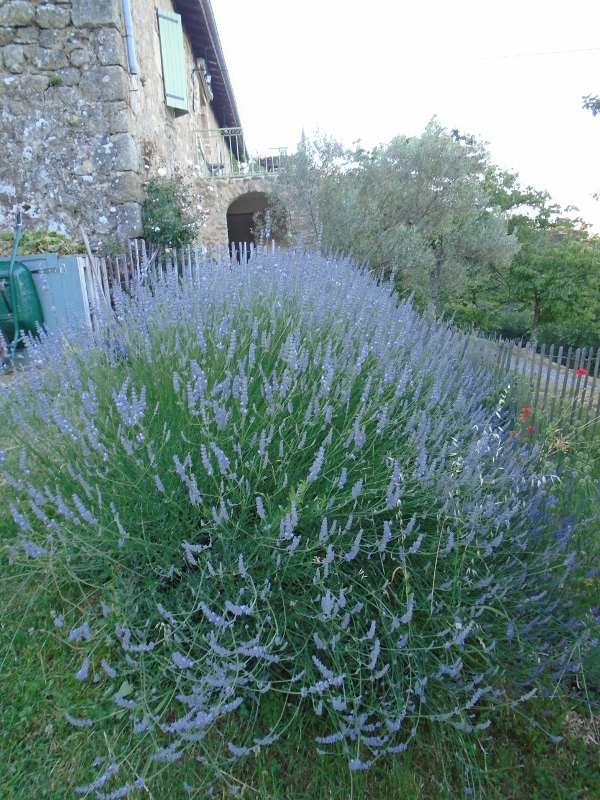 Lavender Grosso. I ordered the first from the Filippi plant nursery and gave them the proper watering technique; two buckets of water over each plant every two weeks in the first year. Nothing after that. And they romped away. I had to play a bit with the wooden chestnut fencing to hold the bank together. 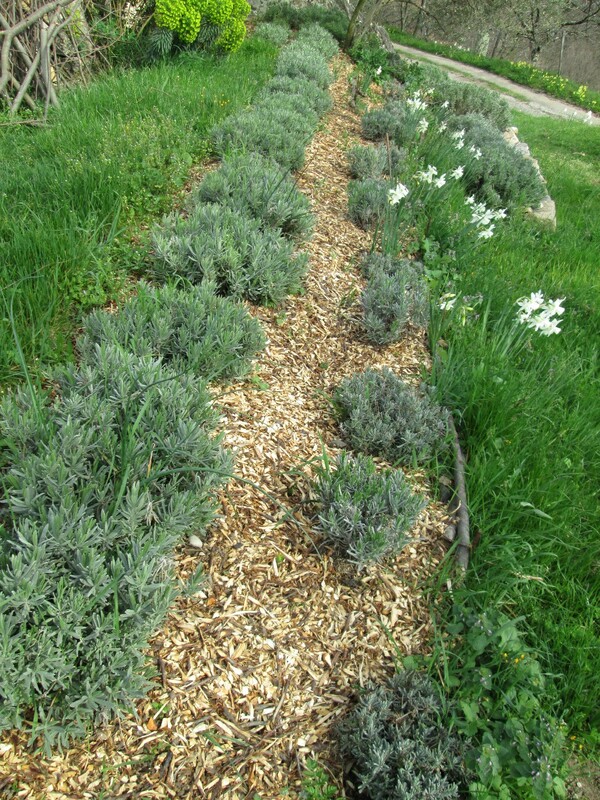 And the mulching was vital. If I can get the mulch down in spring then I usually leave this part of the garden alone. Apart from harvesting. That’s fun. 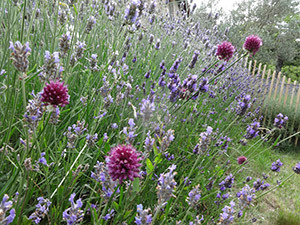 And I planted 1000 drumstick alliums in between the lavenders as I was so taken by the colour combination (borrowed from a planting scheme by Christopher Lloyd). And naturally I can’t stop a bit of tweaking. 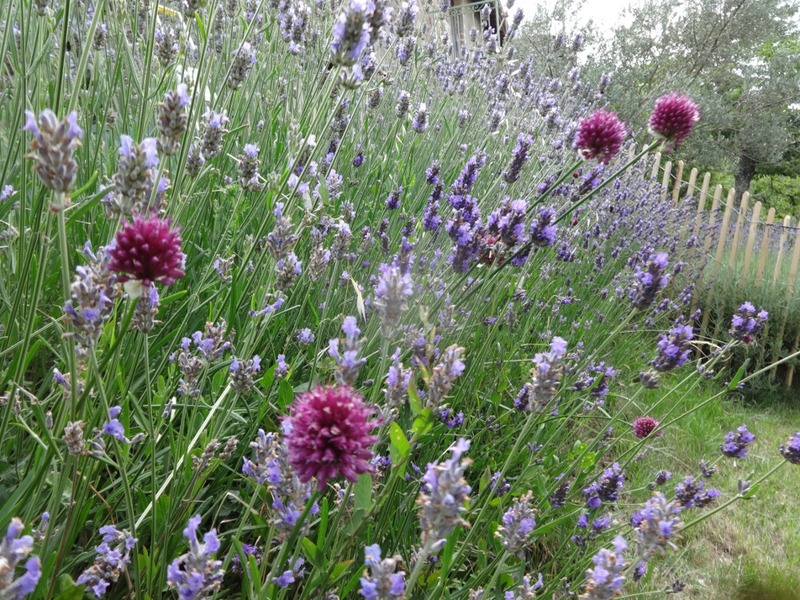 In 2013 I put up a fence that goes between the lavenders. It was deer proofing. But the effect created a bit of asymmetry in the overall scheme. It’s just a simple structure – chestnut logs to mark the base of the planting area. 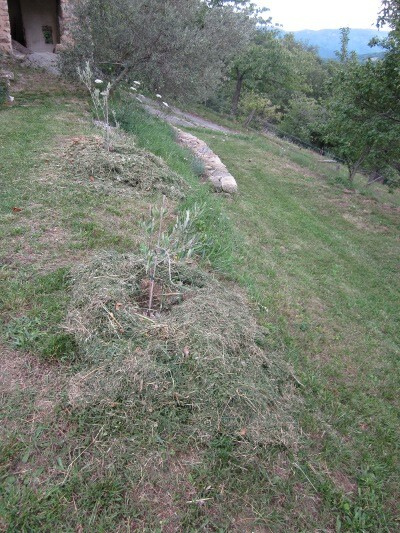 And then removing the grass, digging it over. Planting a few hundred more drumstick allium bulbs. 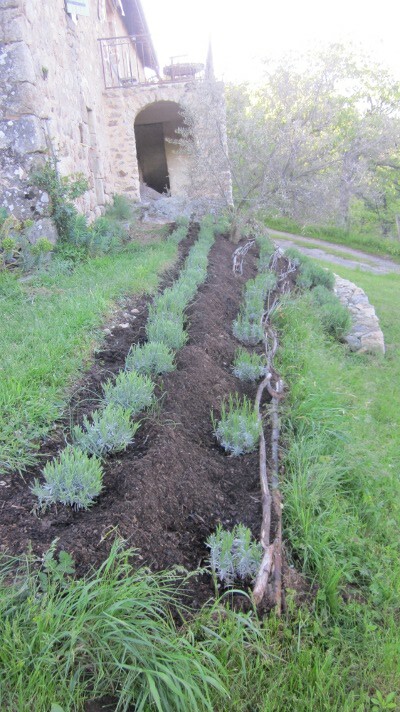 And then counting out how many lavenders I will need to fill the area. I think it will be 18. 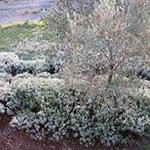 Which will bring the tally up to well over 100 shrubs for this whimsical idea back in 2012. 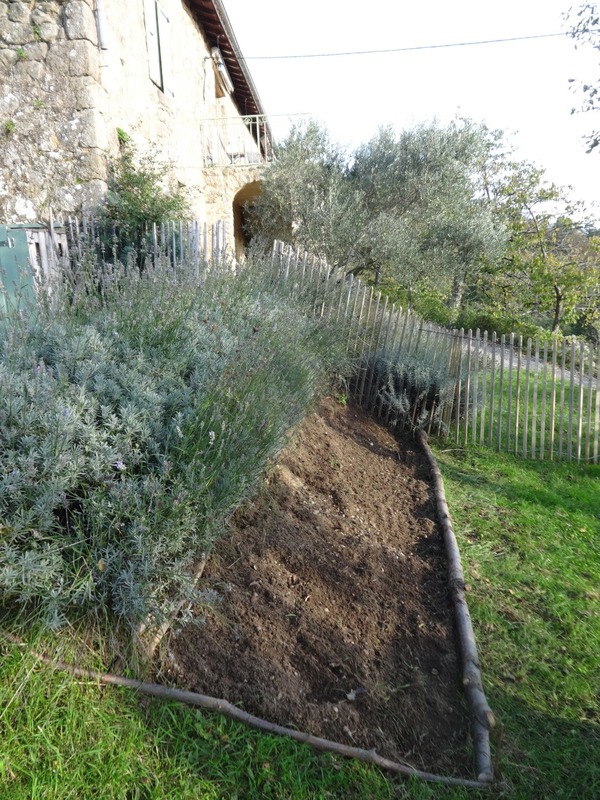 In 2015 this long sloping bank will be utterly clothed in an appropriate Mediterranean shrub. I think Madame de Vesian would be pleased.